Just got back from a quick trip up to the Pacific Northwest to spend New Year’s with the Blue Dinosaur’s family. We enjoyed visiting with extended family, and the kids especially loved spending lots of time with their cousins. After a few days of rain though, I especially appreciated the bright sunshine back here in California. I guess no matter what, I still prefer warm Hawaiian showers with the sun shining or peaking through the clouds, the best. After a day of running errands and general catching up, I needed something quick to throw together for dinner. Diced a bell pepper, cubed two blocks of tofu, and chopped some green onions from my garden. First heat up a little olive oil in a non stick skillet and cook the garlic for a little less than a minute. 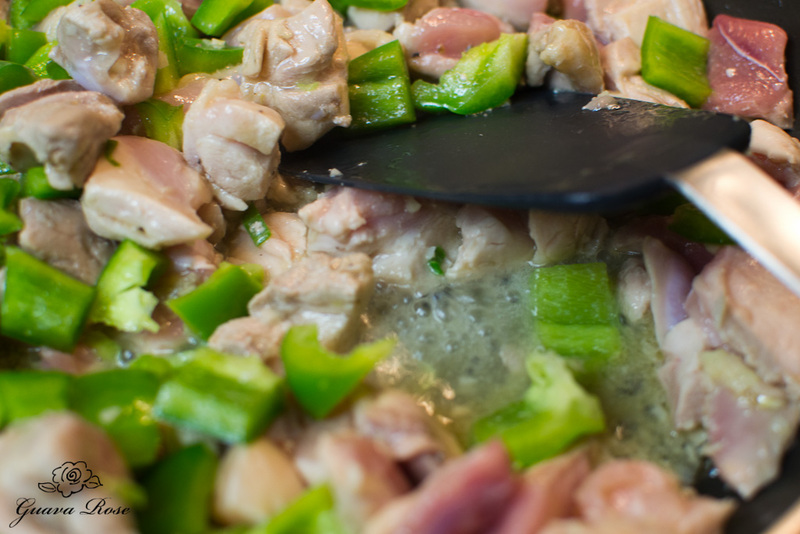 Toss in chicken and bell peppers, and let those cook until the chicken is about halfway cooked. For the sauce– the standard, really quick mix of a little sugar, cornstarch, water and shoyu, but, I add a touch of toasted sesame seed oil for extra flavor. 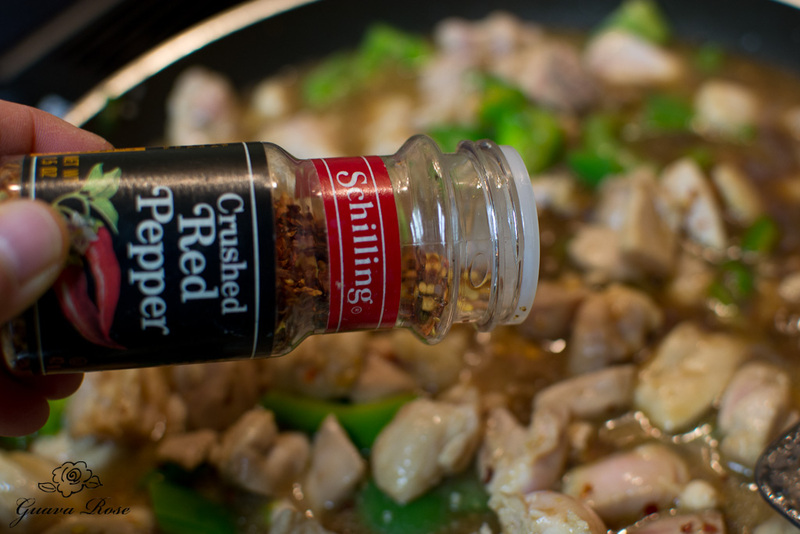 After the sauce cooks and thickens up, sprinkle with crushed dried red chili peppers. I usually season pretty mildly with the dried chili pepper, as Laurel and I like it that way, but the Blue Dinosaur and Quill like it wayyy hotter. So I put the bottle out on the dinner table and they can add more. This dish is purposefully not too salty either, as most of the major health organizations have been calling for everyone to really watch their sodium intake. You can add a little sea salt or more shoyu if you prefer it saltier. 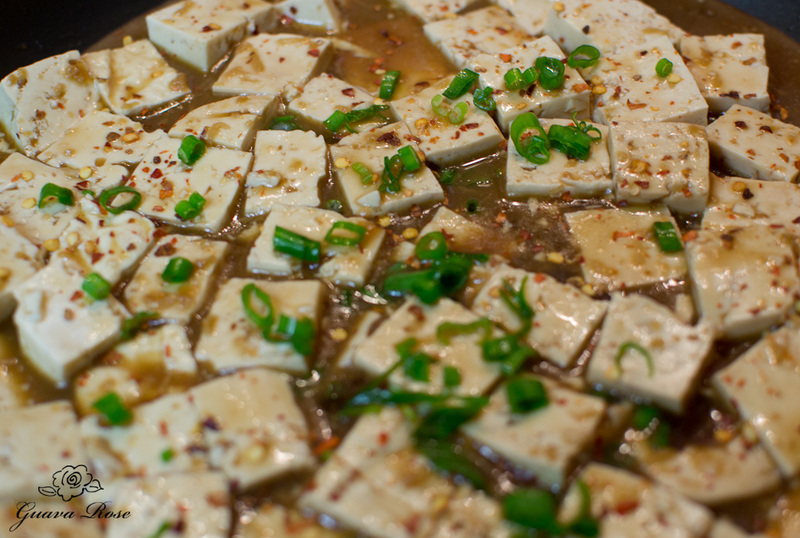 Add the cubes of tofu and bring to a gentle boil to heat through. Sprinkle the top with green onions. This can be made with only tofu too, just as Quill likes it. If I use chicken breast instead of chicken thighs, I stir fry the chicken breast cubes with the garlic until it is halfway cooked, and remove it from the pan. Then I stir fry the bell peppers for a couple of minutes before adding the sauce and continuing on as above. After the tofu has been added in and heated through, I turn off the heat and gently stir in the chicken. Cover the skillet for about 2 minutes, letting the residual heat cook the chicken through. Then pour into a serving dish and top with green onions. I find this keeps the white meat moist and tender. Too much simmering always makes white meat tough. This meal comes together really quickly. Serve over whole grain or white rice. Just don’t forget to wash the rice and get it cooking before you start, unless you already have cooked rice. This was a big bowl of warm, spicy comfort. 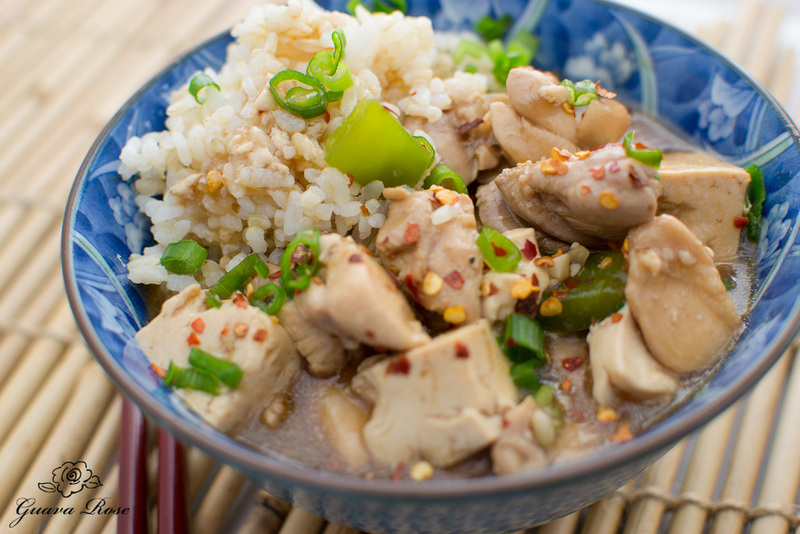 Chunks of chicken and tofu simmered in a warm and spicy gravy. Heat olive oil in a large non stick skillet over medium high heat. Add garlic and stir fry about 45 seconds. Add chicken and bell peppers. Stir fry until chicken is half way cooked. 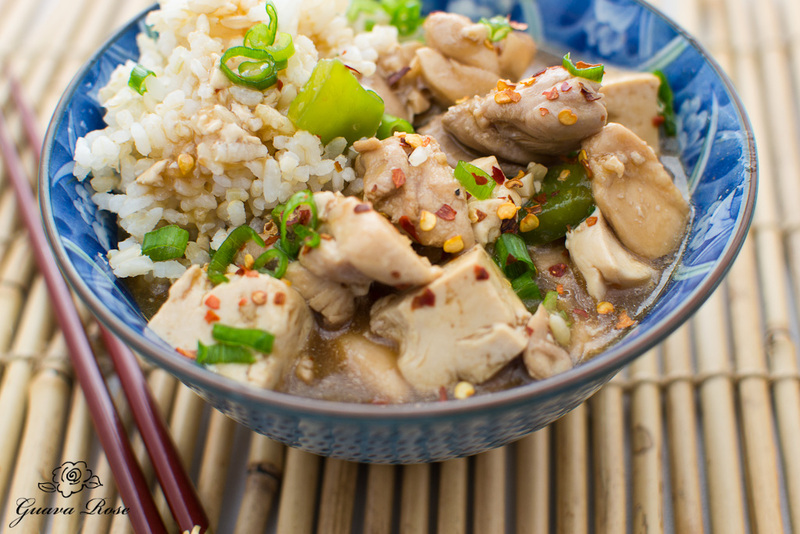 Mix sauce ingredients together in a bowl and pour over the chicken and bell peppers. Stir occasionally, allowing the mixture the bubble and thicken. Add the dried chili peppers and tofu and gently mix in. Cover and let come to a gentle boil until the tofu is heated through. 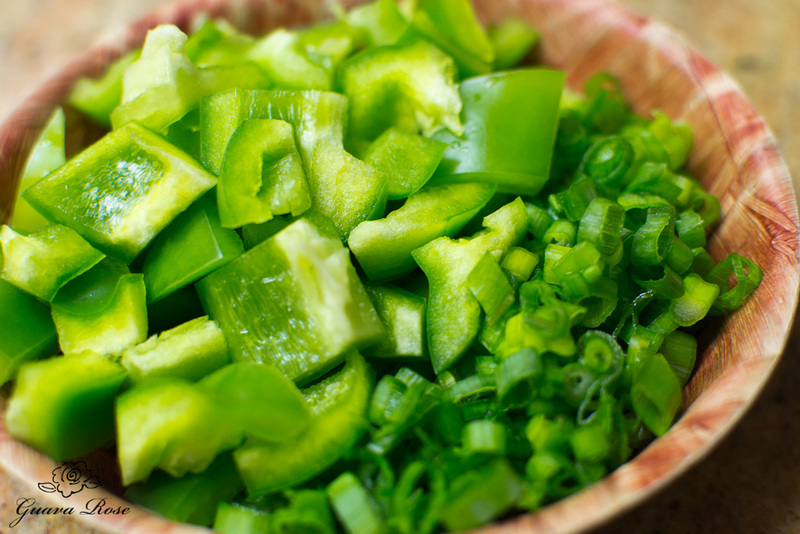 Sprinkle top with green onions. Serve over whole grain or white rice. 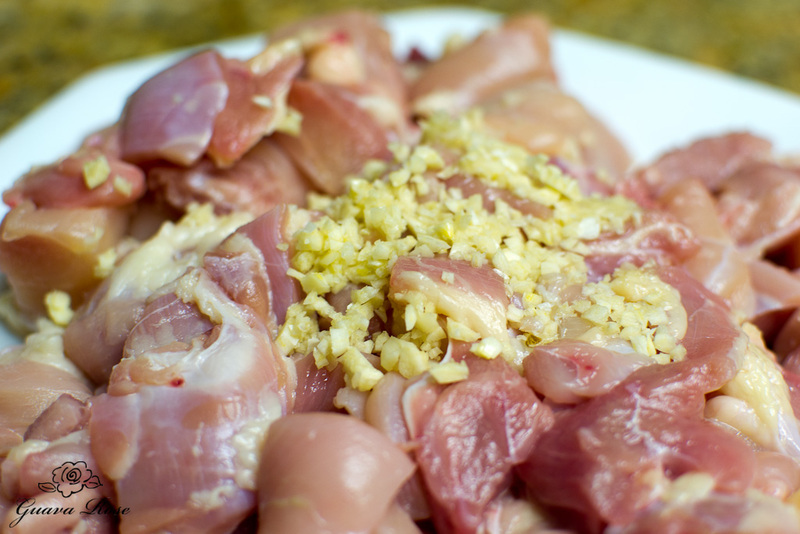 Note: If chicken breast is used instead of chicken thighs, stir fry the chicken breast cubes with the garlic until it is halfway cooked, and remove it from the pan. Then stir fry the bell peppers for a couple of minutes before adding the sauce and continuing on as above. 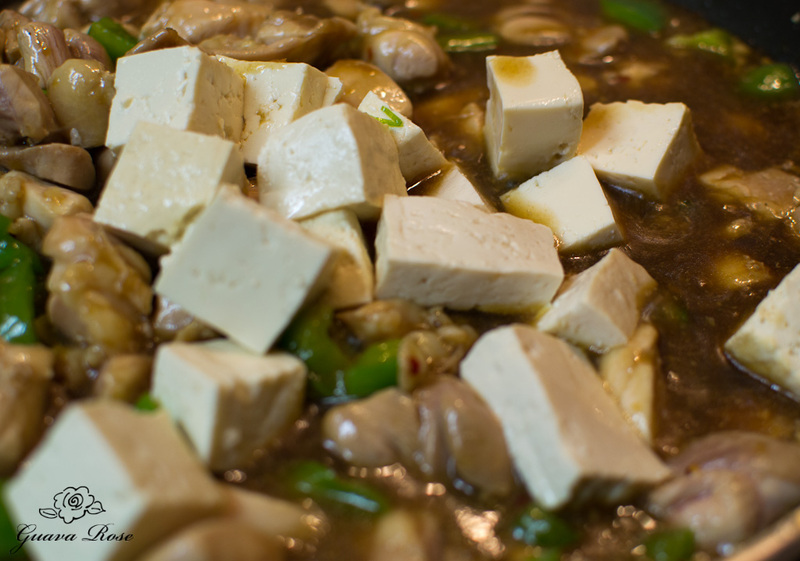 After the tofu has been added in and heated through, turn off the heat and gently stir in the chicken. Cover the skillet for about 2 minutes, letting the residual heat cook the chicken through. Then pour into a serving dish and top with green onions. This keeps the white meat moist and tender. Too much simmering always makes white meat tough.